(CNN) -- Texas firefighters expect to work into next week to put out a 1,200-acre wildfire that has destroyed more than two dozen homes and threatens more, the Texas Forest Service said Tuesday. 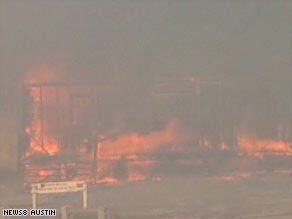 Texas' drought, as well as low humidity and high winds, is said to have contributed to the blaze. The fire was 80 percent contained Tuesday morning but still threatened at least 200 homes and five businesses, said Misty Wilburn of the Texas Forest Service. She said the fire, ignited Saturday afternoon by a fallen power line, has destroyed 28 homes, 12 businesses, two barns and 20 outbuildings in central Texas, about 30 miles southeast of Austin. Texas Forest Service crews, called in after the local fire department couldn't control the flames, will stay until the fire is under control, Wilburn said. "We plan to work on the fire into next week," she said. "We really want to make sure nothing flares back up." A crew from Asheville, North Carolina, is helping to fight the fire, do line improvement and mop up burning logs and other hot spots. And an additional crew will arrive this week. Officials evacuated homes along three roads and opened three shelters Saturday. Two were closed Sunday, and most of the people went to hotels, Wilburn said.